Auckland, a city often mistaken as New Zealand’s capital. 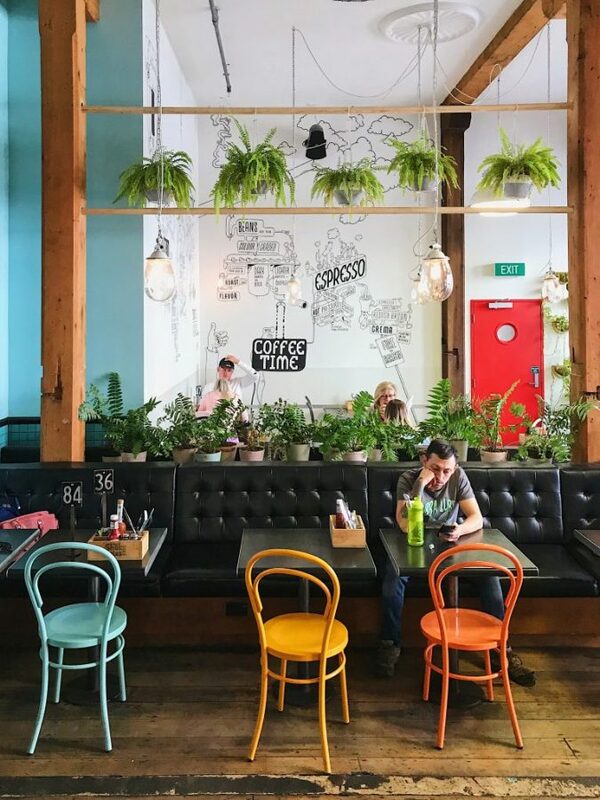 While it is the largest city in the country, the capital is further south in the coffee haven of Wellington, but Auckland can probably take the title of the financial capital of New Zealand! While well-known for being a bustling city for business, Auckland is not massively recognised for tourism and this is definitely a mistake. 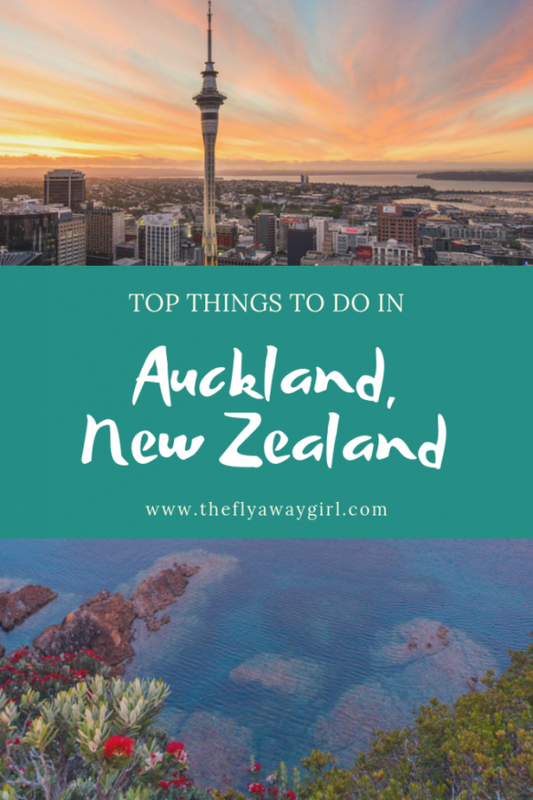 Many people simply use Auckland as a place to start or end their New Zealand trip but if you can you should certainly aim to spend a day or more in the city. There is so much to do from adventuring to the nearby islands and beaches to experiencing the amazing night markets. 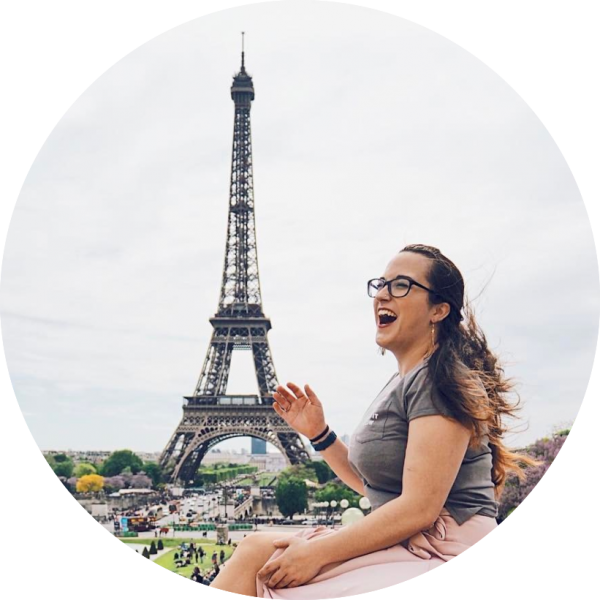 For those short on time, here are two one day in Auckland guides comprising my recommendations of the best things to do in Auckland! I hope you enjoy creating your personal Auckland itinerary from these! Want to download an eBook version of this post for easy reading on the go? Head over to my eBook page to download it for free! Auckland Airport is the largest and busiest airport in New Zealand and therefore it’s the most likely airport for people to fly in or out of. It’s well connected to other destinations in Oceania (Cook Islands, Fiji, Tonga, Samoa, Niue, New Caledonia, Vanuatu etc) as well as destinations throughout Asia, Europe and the Americas. Looking for destinations to fly to from Auckland? 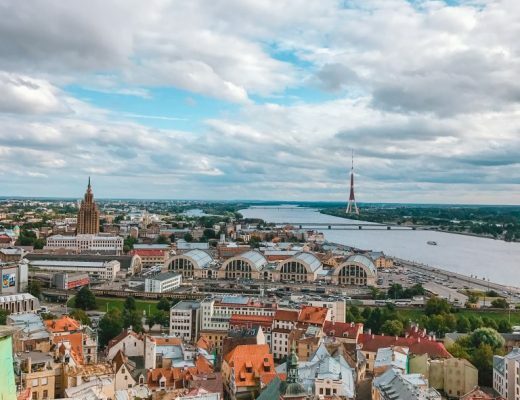 Skyscanner can find you the cheapest flight prices! Auckland is also a great base to travel to other areas of New Zealand. 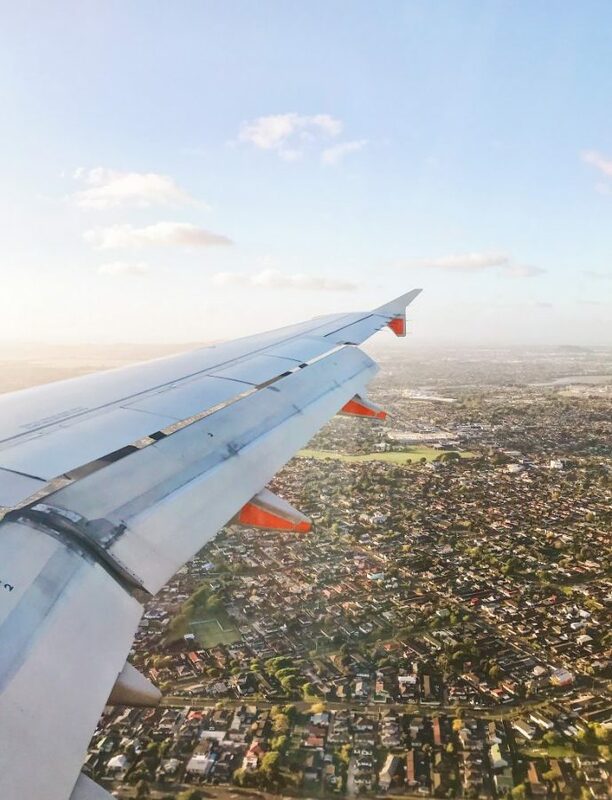 Flights from Auckland go to large cities such as Christchurch, Wellington and Dunedin as well as to smaller airports such as Kerikeri (the nearest airport to Paihia), the remote Chatham Islands and the gateway to the wine region of Wairau Valley, Blenheim. Bus operators such as Kiwi Experience have lots of routes starting in Auckland and the Northern Explorer railway line also runs all the way from Auckland down to Wellington via Hamilton, Waitomo, Kapiti Coast and more. Auckland is a very walkable city but there are also great bus and train connections as well as Lime e-scooters to get around. Download the Lime app to unlock and rent the scooters for a quick and easy way to get around town! When I was in Auckland, I stayed at Nomads Backpackers. It’s a fun hostel, located smack bang in the middle of the bustling centre of Auckland. 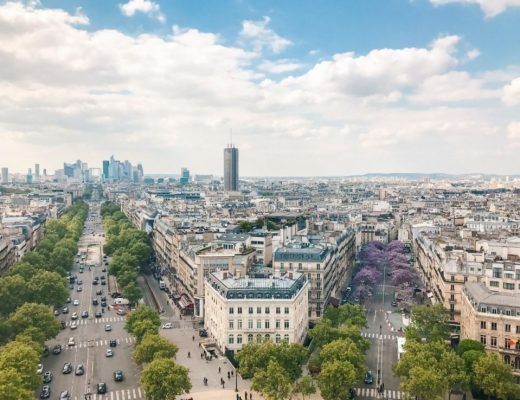 You’re only steps away from multiple bars and restaurants, as well as the bus stops for both Kiwi Experience and Stray, as well as the drop-off and pick up points for the airport bus. Rooms at Nomads Auckland start at NZ$19 for a 12-bed dorm with shared bathroom, NZ$33 for a 4-bed dorm with ensuite and NZ$90 for a double ensuite room. 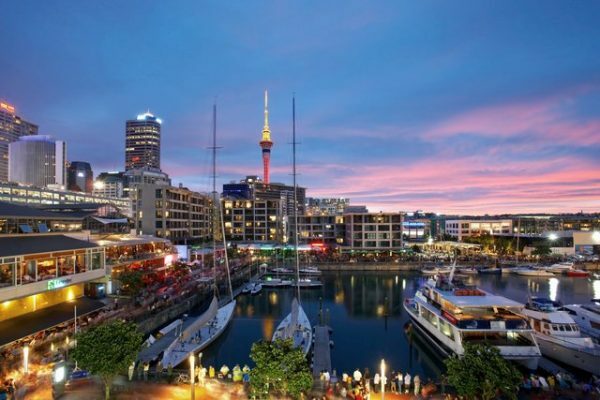 If you’re looking for more luxury in Auckland, the 5-star SKYCITY Grand Hotel (NZ$270) offers spectacular views over the city and the 5-star Hotel Grand Windsor MGallery by Sofitel (NZ$240) is located directly on the waterfront and is within a beautiful historic building. For our first Auckland in a day itinerary, we will be sticking to Auckland city itself. First, start your day off with a flat white or a cold brew at Chuffed and fill yourself up with one of their delicious provolone and gruyere toasties or – if you’re feeling a bit healthier – try their vanilla bean porridge with berry compote. 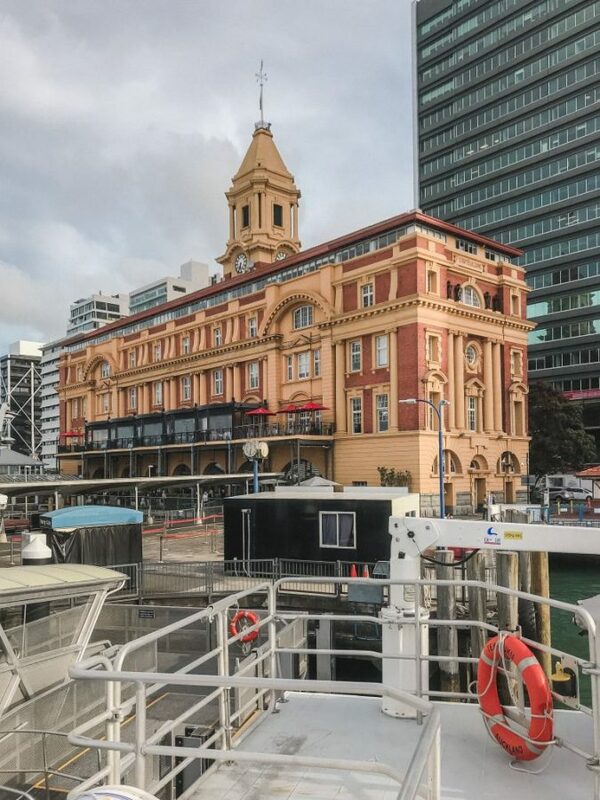 After your breakfast, head down to the harbour and see the beautiful ferry building before heading over to the Sky Tower. 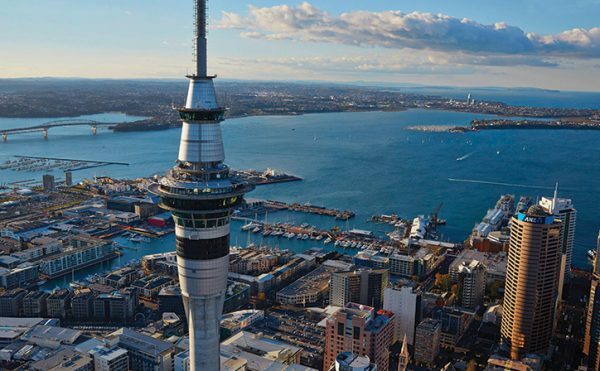 One of the most popular things to do in Auckland is a visit to the iconic Sky Tower. If you’re feeling adventurous, the SkyWalk is highly recommended! 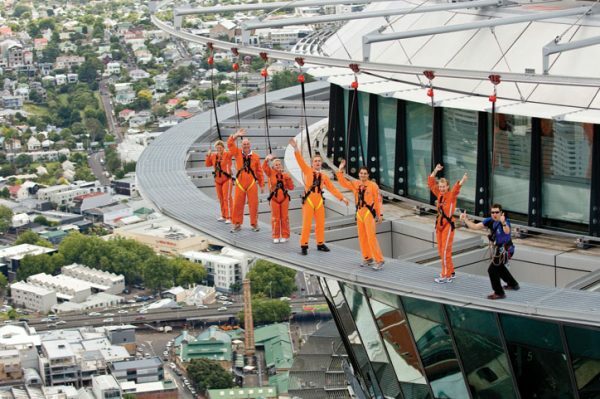 See Auckland from above from a platform 192m above the ground – you’re safely strapped in a full body harness and a seriously attractive jumpsuit (I’m kidding, it’s an intriguing bright orange) and you get to walk around the platform which is only 1.2m wide. You can lean off the edge and take a look down if you dare… although not recommended if you’re not a fan of heights! The SkyWalk costs $150 for an adult and $120 for a child. If you’re a student in New Zealand, you get a discount of $20 off the aduItprice. If the SkyWalk wasn’t adventurous enough to get your adrenaline going, then try the SkyJump. A base jump from 192m high down to the SKYCITY plaza – you fall at speeds of up to 85km/h so this is definitely not one for the faint hearted! 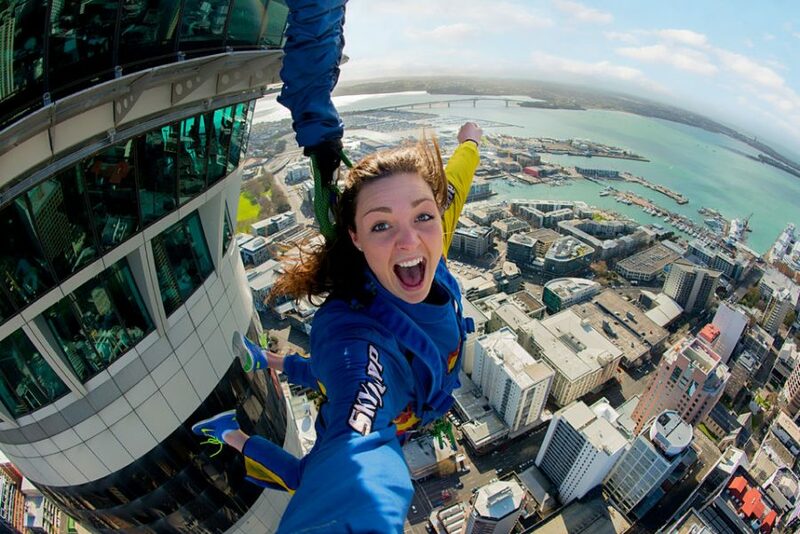 SkyJump costs $225 for an adult, $175 for a child and $195 for NZ students. Even if you’re not a fan of standing on the edge of high buildings or jumping off them, don’t miss a visit to the Sky Tower to head to the 186m high observation level, the 220m high viewing deck and the cafe at a spectacular 182m above the ground. If you’re feeling peckish then the top-rated Federal Delicatessen is a great spot for a bite to eat or a coffee. Admission to the Sky Tower costs only $29 for adults or $20 for students. Auckland Domain is the oldest park in the city and covers an area of 185 acres. 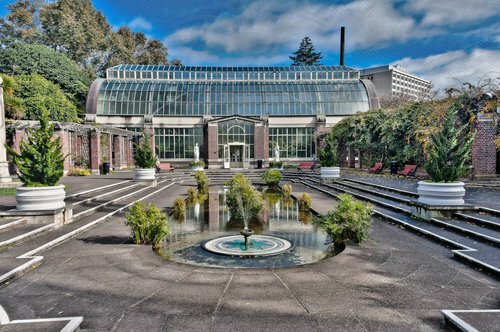 After your morning high in the sky, head to the park for a wander, explore the ‘Wintergardens’ (two large glasshouses of tropical plants) or visit the Auckland War Memorial Museum (free for New Zealand residents, $25 for international visitors). 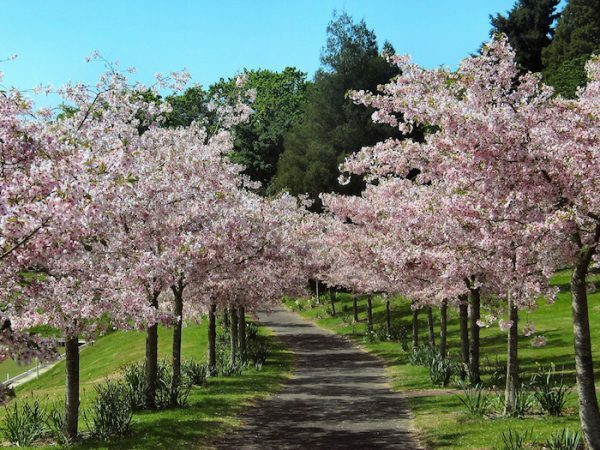 If you visit around mid- to late September, you might be lucky enough to see the spectacular cherry blossom trees in the Domain in bloom. From the Sky Tower it’s about a 30-minute walk to reach Auckland Domain or you can take a city bus from SKYCITY instead. Both the InnerLink and OuterLink services go from SKYCITY to Parnell and the War Memorial Museum and take around 10-15 minutes. The fare is $3.50 if paying by cash or $1.90 on an AT HOP card. What is the AT HOP card? It is a reusable prepay card that you can use on trains, buses and ferries around Auckland. The card itself costs NZ$10 and requires a minimum top-up of $5. The AT HOP card is only worth it if you will be using it for at least 6 fares in zone 1. If you are spending multiple days in Auckland (and if you are travelling by ferry, e.g. to Waiheke Island) it could save you money. By now it’s likely time for lunch or, if you ate at the Sky Tower, afternoon tea or a coffee. The Wintergarden Cafe is a perfect spot for a light lunch or for a pastry and coffee. If you haven’t had enough of walking after visiting Auckland Domain, don’t miss a visit to Maungawhau, or Mount Eden. 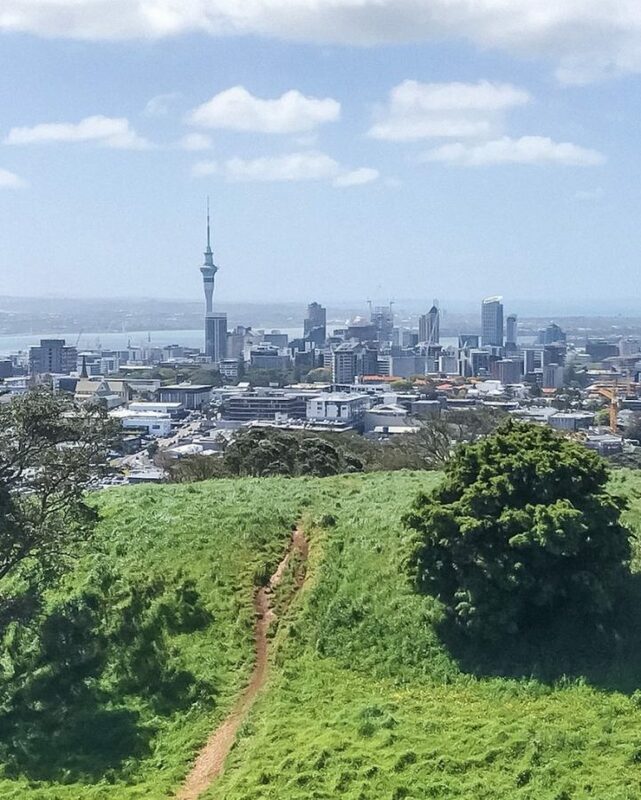 A dormant volcano and the highest natural point in Auckland, this is a great walk with impressive views over the city. The entire walk from Auckland Domain to Mount Eden up to the summit will take you around 45-50 minutes. Alternatively, the OuterLink bus will take you from the domain to Mount Eden in about 10-15 minutes ($3.50 in cash, $1.90 with AT HOP) and then the walk to the summit takes around 20-30 minutes. After all your walking, you’ve probably built up a substantial appetite. 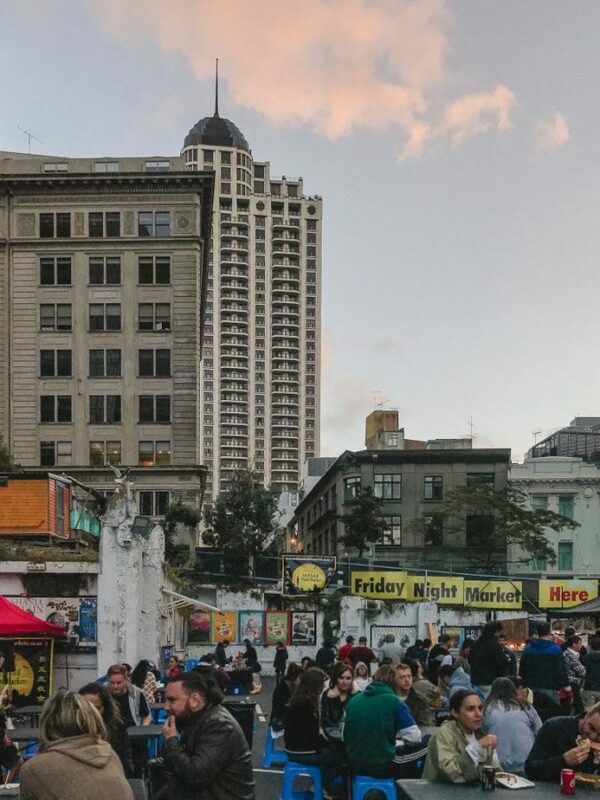 Head to one of Auckland’s amazing night markets for a huge variety of food and drinks – Nomads Auckland is right by some of the night markets so it’s so easy to get to one of them and have your fill of delicious food. 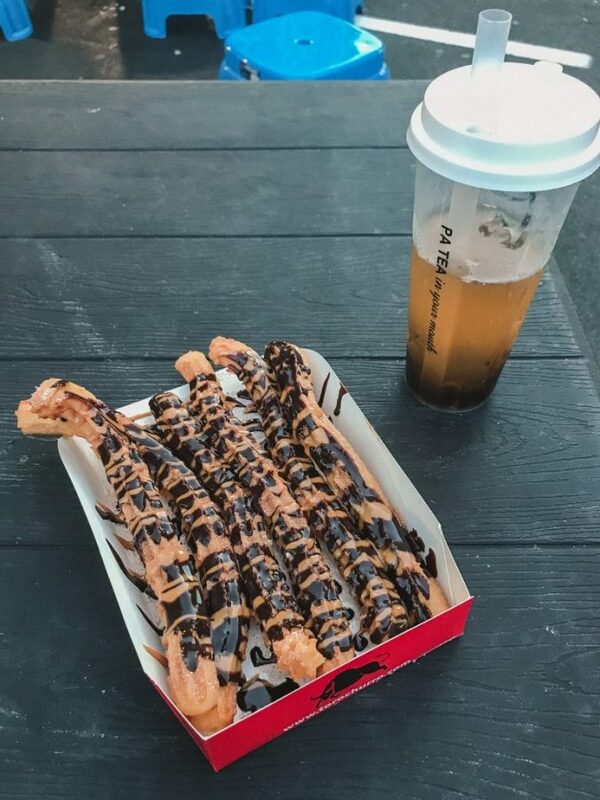 I visited Shortland Street night market and ended up getting a great mix of different foods – a delicious bowl of ramen ($10), bubble tea ($5), a BBQ pork bun ($2.50) and churros drizzled in caramel and chocolate sauce ($6). I couldn’t finish the churros and had a major food baby after so I probably could have done with less food than that… Even so, a delicious dinner for $23.50 including bubble tea was well worth it! There are other night markets throughout Auckland but further afield in areas such as Mt Wellington, Botany Town Centre, Henderson and Pakuranga. If you are there on a night other than a Friday or Saturday, head to Britomart instead for a range of excellent options including Lord of the Fries (vegan burgers and more – I highly recommend the poutine burger) and Yeah Bowl (Hawaiian poke bowls). If you want a break from cities (or if you have multiple days in Auckland) don’t miss taking the ferry over to spectacular Waiheke Island. 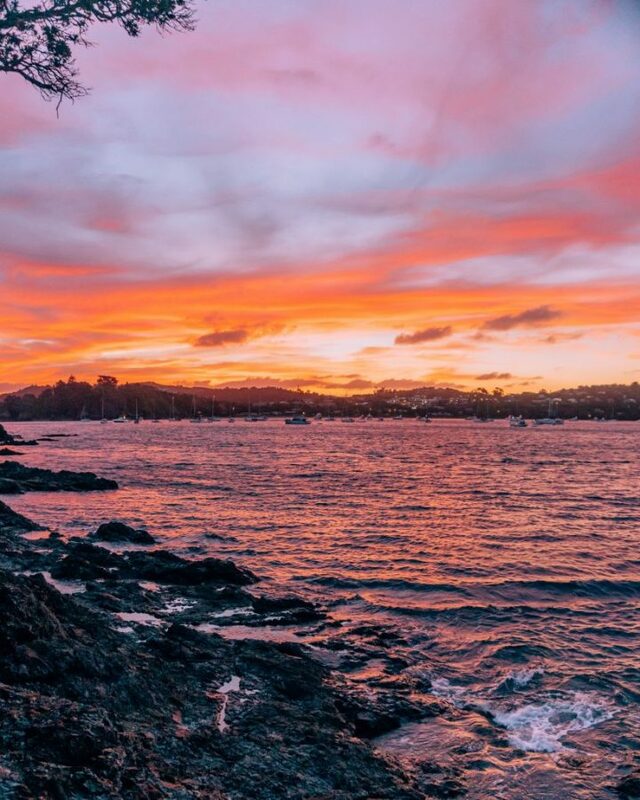 A trip to Waiheke Island is a great way to spend one day in Auckland, particularly if you want to see incredible beaches and magical sunsets or to visit some of the excellent wineries on the island. Start your day off with a delicious breakfast at Shaky Isles, possibly my favourite cafe in Auckland. There are three locations in Auckland and the Britomart (22 Customs Street East) location is perfectly placed on the way to the ferry terminal. Try one of their amazing bacon butties (my favourite), eggs Benedict or a healthy açai bowl. In my opinion, the Ferry Building is one of the prettiest buildings in the city. 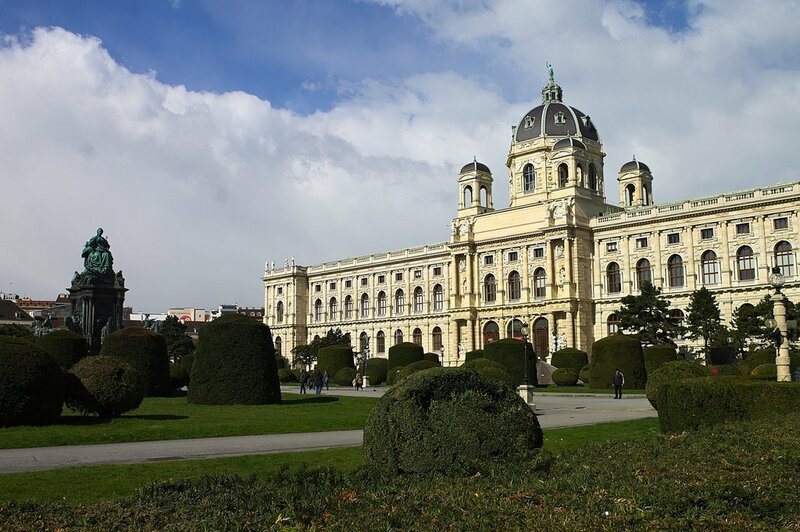 Even if you don’t have time to do a trip by ferry, you should still visit the Ferry Terminal to see the impressive Edwardian Baroque building. For the ferry to Waiheke Island you can either buy tickets in advance (valid for one year from date of purchase) or buy them from the ticket desk at the ferry terminal. The ferries depart very promptly at their scheduled time so make sure to get there on time! 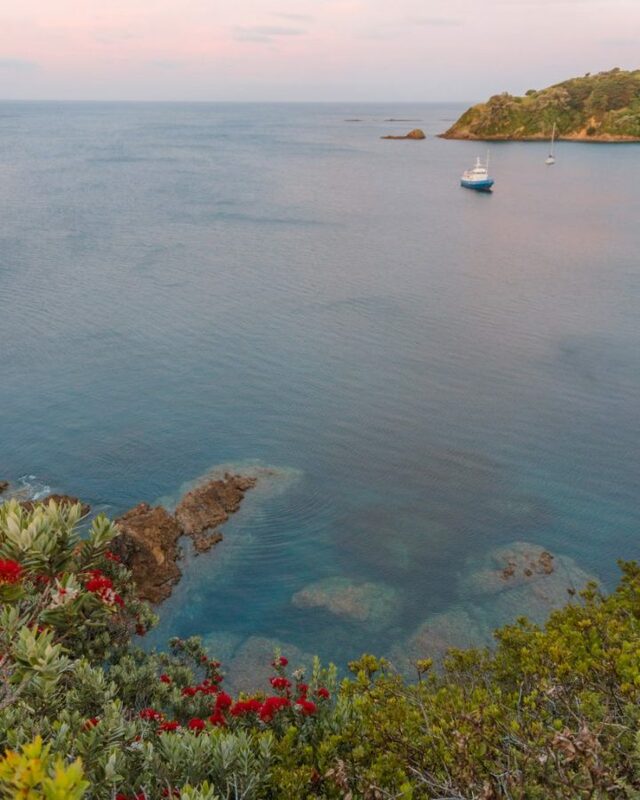 There is so much to do on Waiheke Island, whether you come for a full day or only a half day. There are two main ways to get around Waiheke – the public bus service or the hop-on hop-off tourist bus. If you are going to leave the island before 7:30pm then the tourist bus is the best option as it takes you to the best spots on the island and you get full commentary as you travel. Book your return ferry ticket and Hop-on Hop-off bus together for only NZ$65! If, however, you want to see the sunset on Waiheke Island and head back to Auckland afterwards then it is better value to get a day pass on the public bus service (NZ$10) as the tourist bus only runs until 7:30pm. Alternatively, if you plan on spending your entire day on Waiheke, want commentary about all the places you see and visit but also see the sunset then you can always purchase a single ticket (NZ$3.50) back to the wharf in addition to the hop-on hop-off ticket. I would recommend starting your Waiheke exploring in the little village of Oneroa. Approximately 10 minutes by bus from Matiatia Wharf (where the ferry docks), Oneroa is a picturesque village with some of the best beaches on Waiheke. It’s also a great spot with lots of cafes to grab a coffee or, if it’s a hot day, a delicious gelato from Gelato Company. 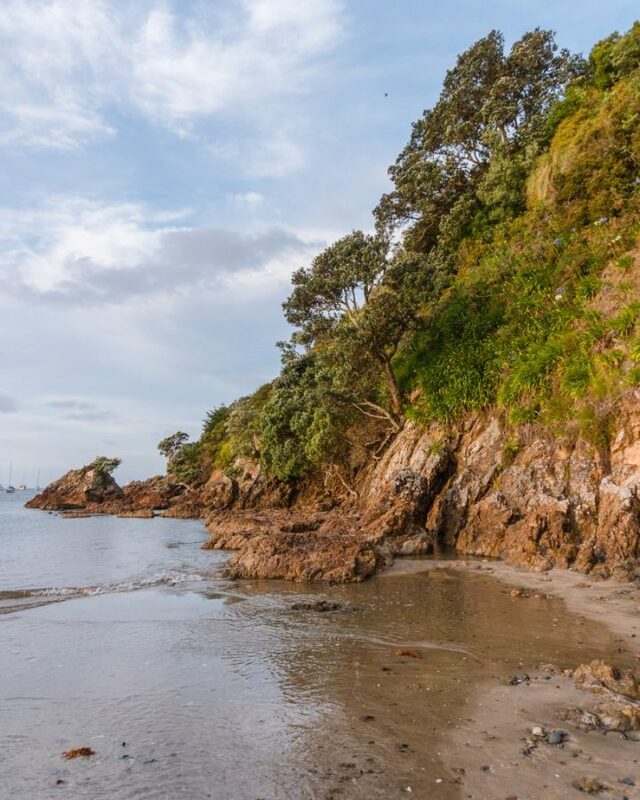 From Oneroa Village it’s only an 8-minute walk to Oneroa Bay, one of Waiheke’s most popular beaches. The beach is sheltered and faces north, meaning it’s usually warm and sunny in the daytime. It’s a great beach to relax for a while, but my favourite views of the beach are actually from further away! After spending a little bit of time enjoying Oneroa Bay, head over to Little Oneroa. It’s a popular beach with families since there’s a playground there, it’s sheltered and there’s also a free barbecue for anyone to use! 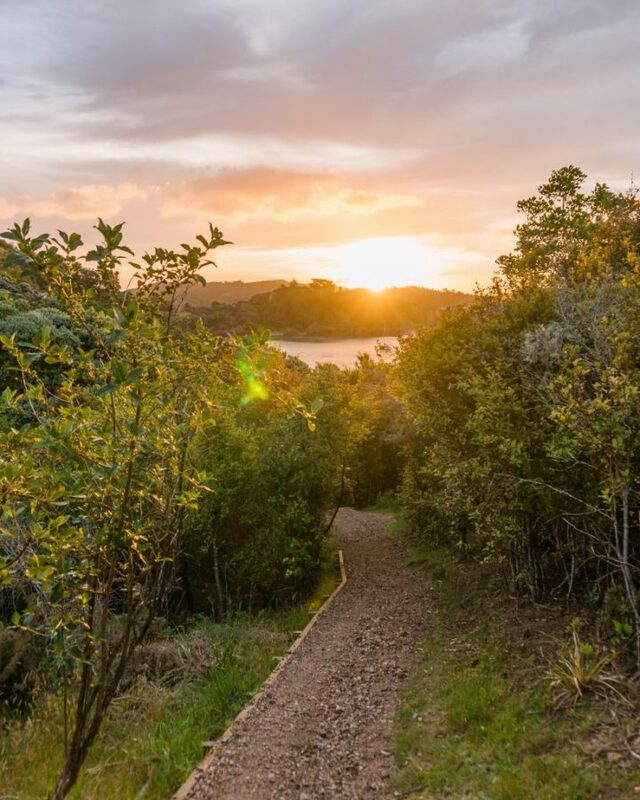 It’s also a perfect starting point for a walking trail that offers spectacular views over Oneroa Bay, Little Oneroa and throughout Newton Reserve. The walking trail starts from the eastern side of Little Oneroa (just beside where the photo above was taken). I actually didn’t initially realise it was a walking trail as I just went up the steps to get a better view over the bay – it was an incredible accidental find! If you keep following the trail you will be rewarded with spectacular views over Little Oneroa and Oneroa Bay and eventually over Sandy Bay and Fisherman’s Rock. After exploring Oneroa, you can also visit other beautiful beaches like Sandy Bay, Palm Beach and Onetangi as well as the impressive Whakanewha Regional Park. There are also many wineries you can visit and do tours and tastings at, such as Man o’ War winery at the eastern end of the island or Cable Bay winery in Oneroa, where you can do a tasting for only $10 or a winery tour and tasting for $20. You can also do a full 6-hour guided wine tour visiting three different vineyards, including transport around the island for $125 per person if you want a more in-depth wine experience! Waiheke Island was actually my favourite place for sunset in the entire North Island so if you can, stay until the sun sets! Head back to Matiatia wharf and hop on the ferry back to Auckland! There is a bar and cafe on the ferry if you want to grab a bite to eat or a drink on the way. The journey takes around 40 minutes and the cafe closes near the end of the journey so if you want something, grab it earlier rather than later! Once back in Auckland, head to Britomart or one of the night markets for something to eat if you’re hungry. If you’re fancying Asian cuisine then I highly recommend either the night markets or, for a sit-down meal, Wok’n’Noodle. My favourite cocktail bar in Auckland is cosy corner bar Mo’s on Federal Street, not far from Customs Street East. It’s a small bar that has seating for maybe 10 people maximum (with standing room for about 10 more) but their cocktails are excellent! The cocktails aren’t cheap at $19 for the majority of them but they are well worth the price. If you’re looking for a bigger night out in Auckland than a delicious cocktail in a small corner bar, head down to the waterfront and check out Danny Doolan’s for $9 jugs of beer. For more top nightlife in Auckland, check out Pure New Zealand’s round-up of the best spots in the city. 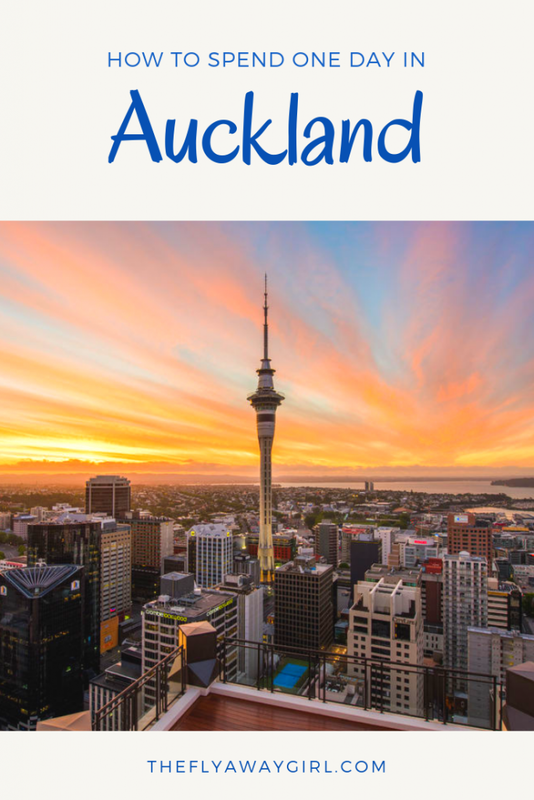 Auckland is a great city to spend a day or two and I hope these two Auckland itineraries can help you plan your trip! Whether you have one day in Auckland or three, there is so much to keep you occupied. Let me know in the comments what activities you would do in Auckland! Want to download an eBook version of this post for easy reading on the go? Head over to my eBook page to download it for free! Available in both .epub (for iBooks, Google Books, Kobo etc) and .mobi (Kindle) formats.